Zombie Deer Disease: New Sign of the End? There is a new reason to be afraid. It is called zombie deer disease and it is spreading. If this sounds like something out of a horror movie, it is not. This is very real. This wasting disease is spread by prions just like mad cow disease, the disease which caused such fear in the late 90s and the early 2000s. Michael Osterholm, the director of the Center for Infectious Disease Research and Policy at the University of Minnesota said, “It is my best professional judgment based on my public health experience…that it is probable that human cases of CWD associated with the consumption of contaminated meat will be documented in the years ahead. It is possible that number of human cases will be substantial and will not be isolated events,” (see above citation). A prion disease like CWD and mad cow disease , is caused by prions which are misfolded proteins. The cause of this misfolding is unknown. These diseases cause brain tissue to become ‘spongy’ which is why they are called wasting diseases. Scientists still don’t completely understand how these prions multiply and they don’t know how to stop it. Viruses and bacteria have DNA, RNA or both. Prions, which are much smaller, have neither. How do we view this through the lens of end time prophecy? (Matthew 24;8). This means that signs will begin by things getting our attention. After a while, there will be slight discomfort. This accelerates to much discomfort and culminates in what the bible calls travail which is excruciating. We, as Christians, need to remember that after all the travails of childbirth, there comes a beautiful child. When Jesus used childbirth as a metaphor, it included the culmination of His plan on Earth. In other words, travail births the Kingdom of Christ. 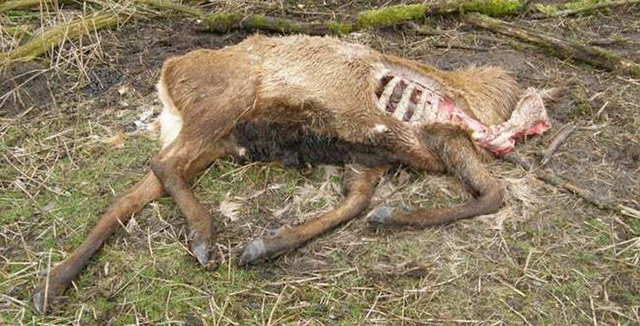 Could this ‘zombie deer disease’ be a birth pang? I think so. One of the Four Horsemen of the Apocalypse is Famine. We are already seeing crops fail and locust in near biblical proportions. If people can’t supplement their diets with wild game, it could be indeed, lead to famine. This zombie deer disease could fall right in line with three of the methods of killing given to Death in the Tribulation. It could induce famine or at least exacerbate it. If you became hungry enough to eat wild game that was infected with the pestilence, you would be killed by the wild beasts of the earth without ever having been attacked. Another aspect of this disease to consider is, as the brain deteriorates, those effected can become aggressive. So, it could lead to animal attacks. The Bible says that “Men’s hearts will fail them for fear, and for looking after those things which are coming on the earth,” Luke 21:26. Those whose hearts will fail them for fear are those that don’t know Jesus. Redemption implies that we are bought with a price and the purcher is coming for us. What great news!